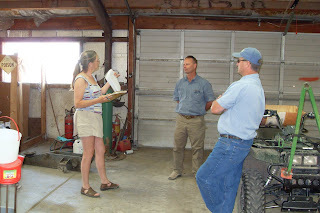 Last Wednesday we had our inspection of our farm by Nancy, an independent 3rd party inspector for Food Alliance http://foodalliance.org/. Joe and brother in-law, Jay along with myself were on hand to greet and answer questions. Nancy arrived around 1pm ish and the inspection took a little over 4 hours. Pictured here from left to right is Joe, Jay and Nancy. 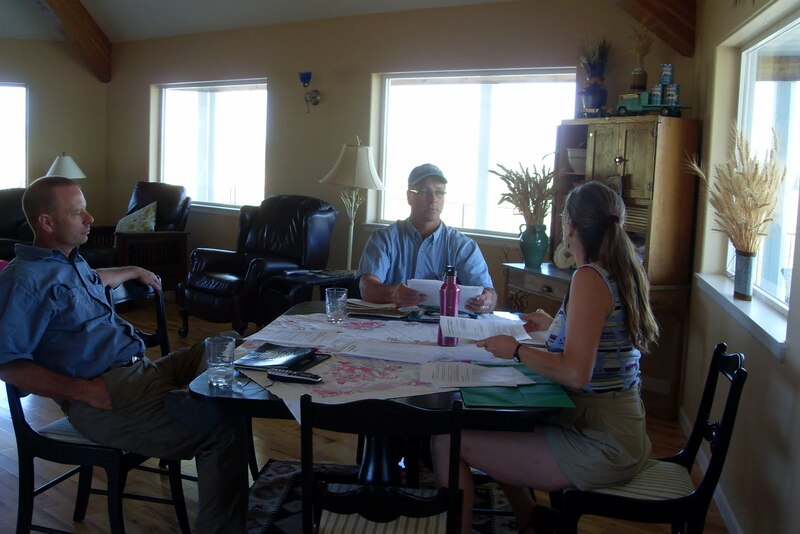 It started out with lots of paperwork and going over crop reports, field monitoring reports, furnishing our employee handbook, records of what products we used on our crops, pest management, etc. So the first 2 hours of the inspection were spent around our dining room table providing all the documentation Nancy requested and answering her questions. The picture above is where we had to demonstrate that all chemicals housed on the farms were in a secure area and properly identified as a chemical storage area. Then we all jumped in the pick-up for tours of the farms, all the while answering more questions and visiting about our farming practices. 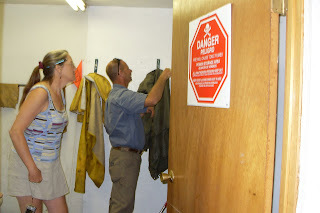 This picture is when we stopped by the Tammany shop for inspection. We explained that we used the latest technology by incorporating a global positioning systems (GPS) in our tractors thereby enabling us to utilize the concept of precision agriculture. In a nutshell, it helps the farmer to not waste fertilizer or crop treatment by reducing any overlap of areas already sprayed. Plus the satellite imagery transmits down to the GPS unit to adjust the rates as needed. It is helpful to read the excellent article about Precision Agriculture/GPS as well as watch our video (just click on the screen) taken during spring work and using the GPS system. We think the inspection went well, but will know more when Food Alliance releases it's findings and if we have anything to correct based upon Nancy's report. So I'll keep you posted.